Freddie Timms, Bigaaninny Gorge Bungle Bungles, Courtesy Coo-ee Aboriginal Art, 1998. Freddie Timms was born at Police Hole c.1946, and followed in his father’s footsteps, becoming a stockman on Lissadell Station as a young man. After an eventful life on stations throughout the East Kimberley he settled at Frog Hollow, a small outstation about 20 Km from the newly established community at Warmun, and worked for a time as a gardener at the nascent Argyle Mine. He began painting in 1986, in the company of elder artists such as Rover Thomas and Hector Jandanay, who were already achieving notoriety at this time. Waringarri Arts, in Kununurra, was newly established and Timms requested art materials from Joel Smoker, the first art coordinator to visit the community on a regular basis. Smoker recognized Freddie’s potential in his first distinctive canvasses and noted his confident grasp of the medium from the outset. During the last 25 years Timms has become renowned for depicting sites associated with the displacement of his people and the loss of their country. Yet rather than being overt political statements about the ruthlessness and brutality of colonization or the political process of dispossession, his intimate map-like interpretations of country are most commonly rendered with an experiential feel. His first exhibition was held at Deutscher, Gertrude Street, in 1989 to critical acclaim. It included a superb masterpiece Mandangala, North Turkey Creek, 1989. In what appeared as a new and beautiful sense of irregular geometry, soft yet boldly defined blocks of colour depicted the area of Glen Hill and the Argyle Diamond Mine to the north of Turkey Creek. The fact that it now lay beneath water, having been flooded by the damming of the Ord River made the work all the more poignant. There had been no consultation with the traditional Gidja owners. The places where he and his countrymen used walk and camp, along with all its ancestral burial grounds and sacred places, were simply buried beneath the rising waters. During the mid 1990’s Freddie traveled often in the company of Kimberley master, Rover Thomas. He painted a large body of works for Kimberley Art Gallery through its association with the Warmun Community, including two works which currently hold the artist’s highest and third highest prices at auction. Both employ a broader, more colourful palate, than the natural earth pigments widely adopted by other East Kimberley artists. By 1999, Freddie Timms was represented by one of Sydney’s most highly regarded dealers, Frank Watters. His exhibition that year explored the history of an Indigenous bushranger named Major who was shot by police in 1908, after killing whites at Blackfeller Creek. 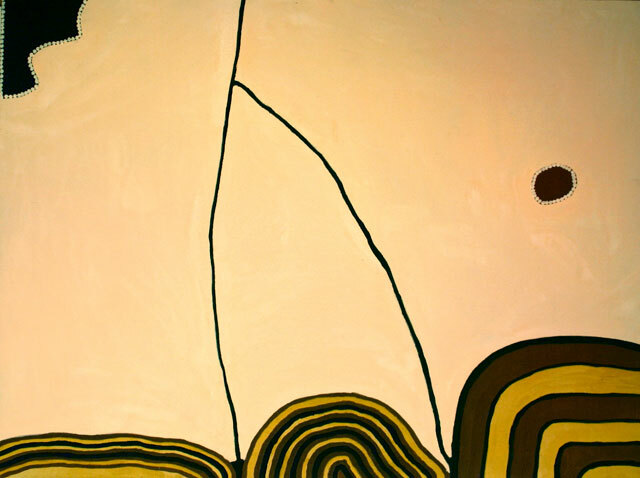 Timms eventually left Watters Gallery and returned to the Kimberley to establish the Jirrawun Aboriginal Art Corporation with help from artist and dealer Tony Oliver. Interestingly source provenance appears to mean little in determining the value of secondary market sales for works by Freddie Timms, nor does the period works were painted, and whether acrylic, powder pigment or natural earth ochres were used as the medium. Size is, of course, the major price determinant along with the aesthetics of the image itself. Those works with a crisp clean contemporary look that achieve harmony and balance through a combination of shape and colour have sold successfully while those in which bright contrasting colours combine with an unbalanced composition seem to fair badly. The average price of his major paintings at auction (larger than 180 x 200 cm.) is around $31,000, works in the mid range have sold for an average of only $8,500 (approx 180 x 120 cm.) and smaller works average just $5,500. Freddie Timm’s work has been championed by Lawson~Menzies whose records almost mirror those of Sotheby’s. The former has sold 32 individual pieces for a total of $397,245 or an average of $10,205 per work while the later has sold 31 works totaling $313,805 in value and averaging $9,870. No other auction house has sold more than three pieces other than Christies and Deutscher~Menzies with six and nine sales respectively, although Mossgreen has achieved the highest average sale price of $24,771. Overall works by Freddie Timms have steadily improved in value and, while they are unlikely to escalate rapidly in to the future, he continues to produce works of great integrity and interest. Now the most important artist working at Jirrawun he is likely to be promoted professionally, shown in good galleries, and included in important institutions and collections during the coming years. There is no doubt that his work will endure and steadily gain in status over time. The work illustrated was created in the late 1990’s and depicts Biggaaninny (Piccaninny) Gorge, which runs through the Bungle Bungle ranges, the traditional land of the now deceased former Frog Hollow resident, and artist Jack Britten. Britten was the senior custodian of this area though he was forced to live away from it for a significant proportion of his life. The laterite pre-Devonian reef from which the range formed left the distinctive layering visible in the rocky cliffs to this day. These are clearly depicted in Timms’ haunting rendition of the site, which was executed in local earth pigments on canvas. The yearly monsoon rains pour off the massive out-crops and are channeled through the deep gorges of Bigganinny Creek into to the Ord River. Though he is yet to achieve a similar level of acclaim to that of the founders of the East Kimberley movement, Freddie Timms is foremost amongst those artists of the second generation. His, is a unique Gidja perspective on the history of white interaction with his people. It is hard to think of another who expresses more poignantly through their art the sense of longing and the abiding loss that comes from the separation from the land that embodies one’s spiritual home.